Furnished homes by Samana will offer excellent returns on investment to property buyers with prices from Dh399,000. Owners will start earning income after paying only 40 percent – making it probably the best investment product in the UAE’s real estate market. Dubai, April 15, 2019: Samana Developers, a Dubai-based developer, announced the launch of a new project, Samana Hills – a Dh100 million property that will host 200 residential units – in the heart of the Arjan community near Miracle Gardens. The residential units, which will soon go on sale with prices starting at Dh399,000 for studios and Dh599,000 for one-bedroom apartments, comes with a very convenient payment plan of 1 percent per month payment scheme for 90 months, following 10 percent down-paymentonpurchase. Samana Hills will be located opposite Dubai Hills Estate at the heart of Arjan. The five-storeyed project consists of 205 residential units, will be delivered by the fourth quarter of 2021. “Samana Hills is an ideal real estate asset in the makingthatwillhelpfulfil a gap in the market for quality affordable hospitality properties that will help investors generate a higher return. The new project launch comes as the developer completes its maiden project – the Dh75 million Samana Greens at Arjan that will be ready for handover in early 2020. 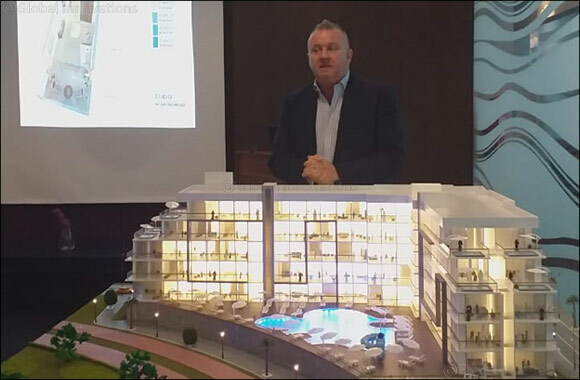 Alan James Gammon, General Manager of Samana Group, says, “Samana Group entered the UAE’s real estate market when the market started to show signs of maturity. Real estate is a long-term business and we have entered in this market with a lot of conviction and it is our firm belief that the Dubai real estate market is the best regulated in this part of the world. “Following the success of Samana Greens, we have taken a conscious decision to offer a greater value to property owners and investors of Samana Hills”. The project will be completed in 2.5 years when the rental income starts to kick in. “This means, the property owners might have to just invest 40 percent (10% down payment and 30monthlyinstalments of 1% each) of the price of the property and pay back the rest from the rental income,” says Alan James Gammon. One of the key features of the property is its luxurious leisure deck with infinity pool, water features, swim up bar area, bbq area 24 hour coffee shop and indoor, outdoor gymnasium. Samana Properties, a part of the Samana Group, had earlier announced the completion of 100 percent of the structure of Samana Greens residential project, a freehold property consisting of 116units. The four-storeyed residential apartment project consists of studio apartments, one- and two-bedroom apartments. The project will be delivered by March 2020, six months before the Expo 2020 will be hosted in Dubai. Samana Greens, located in the Arjan area, is located in front of Dubai's iconic Miracle Gardens, which is easily accessible by two main roads and offers easy access to Dubai's main attractions. The city is surrounded by Sports City, Emaar Hills as well as a number of international schools, hospitals, and services.